Boomers' loss to Angola: ‘Tournament strategy’ or ‘un-Australian’? Last night, Australia’s mens basketball team received some criticism for their performance against Angola in the FIBA 2014 World Cup. The Boomers were ‘upset’ by Angola 91-83, yet it wasn’t the loss that angered people, it was the fact that Australia didn’t do everything in its power to win. From the tip-off, Australia’s intentions were clear, as the Boomers best two players of the tournament so far, Aron Baynes and Joe Ingles, were ‘rested’ from the game. Before the first quarter, coach Andrej Lemanis had emptied the bench, and players like Chris Goulding – who had received little game time so far in the tournament – were given extended minutes on the court. If Australia wanted to lose the game, the strategy didn’t seem to be working too well, with the Boomers ahead at half-time and nursing a double-digit lead in the second half. However, Angloa, led by Yanick Moreira – who top scored in the match with 38 points – stormed back into the game in the third quarter. The Africans were aided by some Australian defence that lacked some, shall we say, intensity? Angola eventually took the lead for good in the last three minutes, and Australia couldn’t overcome the deficit, even though the coaching staff and the players on the court appeared to be trying to win the game. Yet here it comes the paradox: although it was evident Australia was trying to win, they still had five reserves on the court in the final minutes of the game. So the Boomers weren’t really trying to win at all. Confused? The Boomers tactic was to lose the game so as to avoid a match-up with the mighty Team USA for as long as possible. 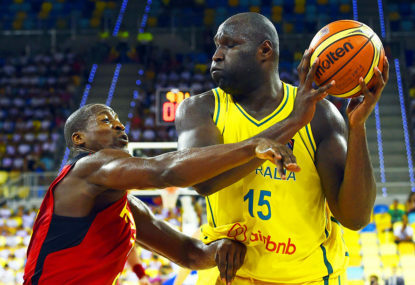 Due to their impressive victory over Lithuania, along with their wins over South Korea and Mexico, Australia was poised to finish second in their pool with a win over Angola. However, in all likelihood, this would have seen them play the United States in the quarter-finals, instead of the semi-finals. So, in order to finish third in their pool – and put them on the opposite side of the draw to the US – the Boomers didn’t exactly go ‘all out’ last night. It should be noted that rest for key players, in a tournament with many games in a short amount of time, was also a consideration in last night’s approach. When the Boomers eventually lost, Twitter blew up. Amongst the many angry tweets I saw, the words ‘tanking’ and ‘un-Australian’ were extremely common. Just as the phrase ‘tournament strategy’ was heavily used in defending the Boomers. Apart from the fact it was great just to see people talking about the Boomers, it was interesting to read the arguments on both sides of the debate. Or as much as much as you can read into a 140-character message anyway. There was certainly plenty of passion and emotion. Many people were legitimately angry at the Boomers, fearing they had angered the basketball gods, and that hoop karma would be coming their way. Many also felt their decision not to try to win the game was ‘un-Australian’ – which I’ve always felt was a funny term anyway. Steve Waugh is considered the classical Aussie sportsman. A win-at-all costs warrior, who always played within the spirit of the game. Yet even ‘Tugger’ appreciated the nuances in ‘tournament strategy’ and applied them when he was skipper of the Australian cricket team. At the World Cup in England in 1999, Australia crawled to victory against the West Indies at Old Trafford, chasing down 111 run in an unbelievable 40.4 overs. Waugh finished 19 not out from 73 balls and Michael Bevan was unbeaten on 20 off 69. Waugh never intended to lose the game, but there was a benefit to winning as slowly as possible. Australia had decided that it would be preferential to play the West Indies in the next round, and by scoring slowly, Australia were helping the Windiest run-rate, which would aid Australia’s ambition to face them later in the tournament. Now granted, that’s not ‘throwing’ a game like the Boomers are accused of doing, but it does remain ‘tournament strategy’, which is exactly what Australia were implementing last night. I completely understand that not trying to win a game jars with many people. It did with me just a little, I have to be honest, as it was a weird feeling to be essentially cheering for a loss last night. Yet if you feel the Boomers effort last night was ‘un-Australian’, perhaps you need to look at the bigger picture. The idea in World Cups in any sport is to advance as far as possible in the competition, and that was the motivation behind last night’s decision. If being Australian is all about ‘winning’ and ‘trying your hardest’, couldn’t you argue that’s exactly what the Boomers were doing last night? The only difference is that they were thinking long-term. The intent was still very much to ‘win’, just with a different methodology than perhaps we’re used to.